Just like thousands of other Disney fans, The Epcot International Food and Wine Festival is something I look forward to each year. Sure the food, merchandise, cooking demonstrations and drinks are fun…but for me…it’s also got a lot to do with the 1300 square foot Ocean Spray Cranberry bog. The bog welcomes you as you enter Epcot from the front of Future World, with it’s 500 pounds of cranberry color and beauty. Friendly Ocean Spray cranberry farmers are also on hand to talk with you about this fascinating harvest. It is a gorgeous display of information combined with entertainment in classic Epcot style. Check out my previous post to learn more! Sometime in my early blogging days I became aware of an event where the media was given a chance to put on waders and get a sense of what it’s like to participate in the harvesting of this beautiful fruit. I thought of it as some sort of Disney dream to be so successful – what kind of media proprietor would you have to be to get invited to such an event? I took this dream into my heart and shared it with my family and friends. I knew it sounded crazy – but we all have a Disney dream, right? Mine just happened to involve wearing waders! 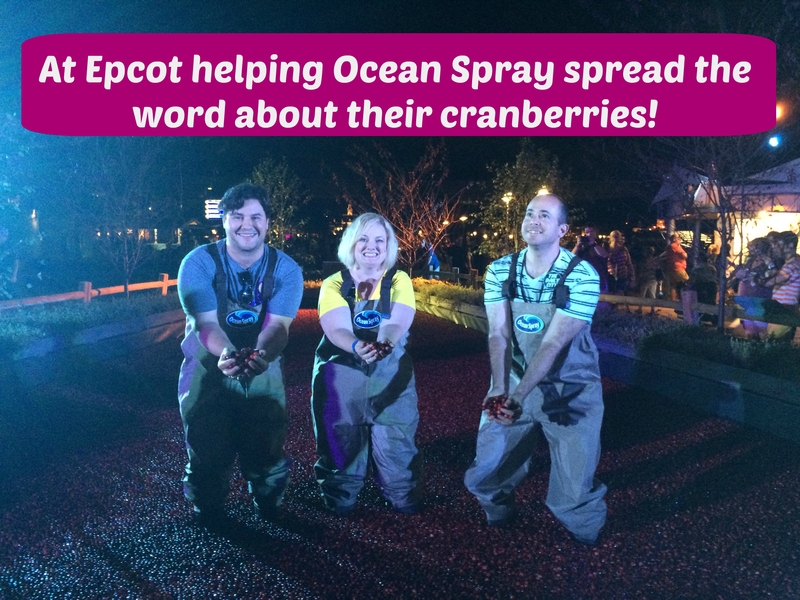 I began reaching out to the wonderful people at Ocean Spray in 2013. As 2014 rolled around, it got close to cranberry time again. When I checked in with Ocean Spray, I was very sad to learn that the negotiations did not work out to bring the bog back. I thought my dream was all but lost. Fast forward to 2015 – I am still “bog obsessed” and I find out it will be back for the 20th anniversary of the Epcot Food and Wine Festival! A couple of days, a few emails and texts later – thanks to the generosity of Ocean Spray – I find myself right in the middle of my cranberry dream becoming actual reality. Only it was better, because when the time came, my two friends decided to join me. The only thing better than an Epcot cranberry bog dream come true…is to get an exclusive experience of the magic with a couple of friends. Other than the Disney cast members and the team from Ocean Spray – we were the only ones inside the bog. Mark (far right) was a little hesitant at first – but I was encouraging him, and so was Sharon from Ocean Spray. I will never forget the way he looked at her and said, “OK – but can I go with HER?” I’m so proud to think maybe my dreams are a little contagious. We were provided with brand new big red socks to wear underneath our boots!We put on our waders, and we had a blast! If you want to see first hand what an emotional response I had to this whole thing, here’s a video. As if this weren’t enough, I was invited to the reception room to experience their fascinating Ocean Spray harvest oculus rift experience. I learned about cranberry harvesting in a whole new way. Does this remind you of the scene from Carousel of Progress? I was able to look up, down, and even behind me as the movie played. Amazing! Another incredible part of my evening was meeting author Lisl H. Detlefsen. Lisl and I have a lot in common for two girls who live so far apart. We will have a whole story on her for you soon. To see more from the reception room, a hilarious demonstration of harvesting by me, our nitro fried dessert, glowing cocktail and MORE check out the YouTube playlist! Follow Ocean Spray online on facebook, twitter, pinterest and YouTube.